Here at DeckStainHelp.com we take pride in the fact that our customers come to us for the latest in deck restoration news and trending topics. New in 2019 is further confirmation that choosing a semi-transparent, water-based stain really is the best overall choice to enhance your deck’s natural wood grain. Like years before, our customers who have used Restore-A-Deck Wood Stain wood and deck stain continue to be satisfied by the appearance and longevity of their deck stain projects. We appreciate your input. If you have used a water-based stain, feel free to leave a comment below and pictures of your completed projects if you have them. When it comes to choosing a deck stain there are a lot of things to consider like how well it is going to protect the deck and what the final finish might look like. In general, there are two basic types of deck stains, oil based and water based. Some people have their preference. For example, oil-based stains have been around the longest so many consumers trust that type of stain. However, with more recent concerns with our environment, many people have been looking in the way of a quality water-based deck stain. This may only be one reason why someone might choose a water-based deck stain. New groundbreaking technology has taken water-based deck stains to the top to compete with, and in some cases outperform oil-based stains. In addition to being eco-friendly, water-based deck stains like Defy Extreme utilize nano particle technology combined with high-grade resins to block the sun’s destructive UV rays preventing graying and fading. This is unheard of with a tinted wood finish and is a first in the stain industry. Water-based stains also prevent water penetration, which may lead to structural damage and costly repairs. In addition, a stain like Defy uses a zinc additive that naturally resists fungal growth preventing discoloration and wood decay. Deckstainhelp.com is your number one source for deck staining tips and trends on the internet in 2018. Mold and mildew can be problematic for your wood decks, see below for why this happens and what you can do to prevent it. 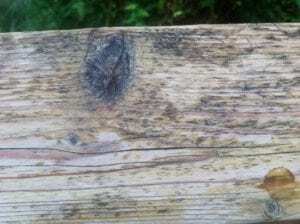 Leave us a comment if you’ve encountered mold and mildew on wood decks. Learning your deck has attracted unwanted mold and algae can be disheartening but it is not the end of the world. These contaminants can be removed to reveal a beautiful surface once again. How to remove mold and algae from decks is a common question asked by homeowners. But with the right knowledge, it can be done over a weekend with no problem. 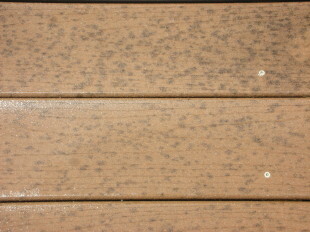 Mold or mildew growth is a common problem during deck staining when using an oil based stain. Today we talk about what causes your deck to turn black during the staining process and how to prevent it. If you have encountered mold during your deck staining project, we want to hear from you. Feel free to leave a comment below with pictures of your deck stain projects. Most any exterior surface subjected to the elements is prone to natural occurrences like mold growth. Oil-based stains are no different. Although they can provide years of protection to exterior wood surfaces, they can be prone to mold in some circumstances. There are however some reasons that can increase mold attraction to oil-based stain.